This is a guest post by Tim Woodbury of MidpackRunner.com. 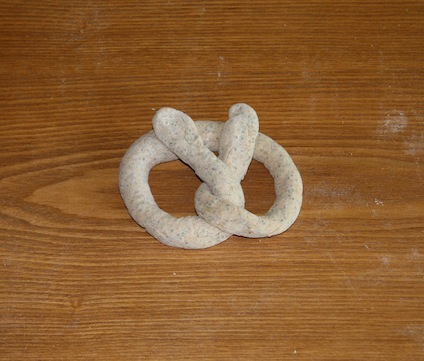 The origin of the pretzel is storied and mysterious. Most accounts trace their invention to Christian monks, but these stories are almost as many and varied as the forms of the pretzel itself. For me, pretzels conjure up images of hot summer days, lemonade, and baseball stadiums. These soft, chewy rings were a treat to be enjoyed in the company of family and friends. Like a warm, bready hug. Recently I’ve come to appreciate their value as a post-run recovery food. This recipe contains a healthy combination of whole grains to give you the carbohydrates you need; chia seed for an accessible boost of protein for muscle repair and omega-3s to reduce inflammation; and what pretzel would be complete without coarse salt for electrolyte replenishment? In a small measuring cup, combine the chia seed with ⅓ cup water. Stir until chia begins to gel, then set aside. In a medium bowl, mix yeast, brown sugar, molasses, and ¾ cup heated water. Stir until sugar is fully dissolved. Let the mixture stand for 10 minutes to activate the yeast before continuing. Add the hydrated chia, flour, and salt into the yeast mixture. Stir the mixture until it begins to form a dough, then knead by hand until the dough is smooth, satiny, and slightly elastic. Place the dough on a lightly floured surface. Cut it into 6 even pieces. Roll each piece into a log, then set aside for 5-10 minutes to allow dough to settle. Continue to roll and relax as necessary until each piece of dough is about 15 inches long and approximately finger width. Now the real fun begins. It’s time to shape the dough. 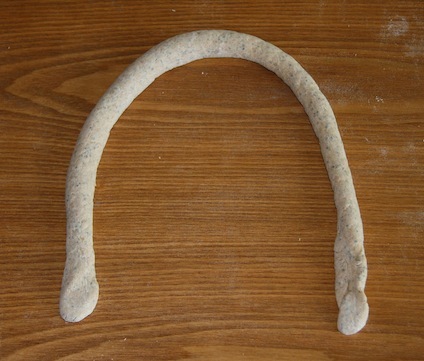 Begin with the dough in a horseshoe with the open side facing you. Taking one end in each hand, cross the right hand over the left. The ends should now be in the opposite position from where they began. Again taking one end in each hand, cross the right hand over the left a second time. This forms the classic pretzel twist. Finally, pinch the pretzel lightly just above the twist (or at the bottom of the loop, if you prefer to think of it that way). Leaving the loop in place, fold the twisted ends up toward the top, using the pinch point as a pivot. You now have a completed (if upside down) pretzel. Once all of the pretzels are, well, pretzeled, place them into the fridge for 15 minutes or until they become slightly firm. While you wait, begin the final part of the process below. Before baking the pretzels, you want to boil them briefly in an alkalized solution. This activates the starches in the dough, forming a crust that prevents the pretzels from rising too much in the baking process. It also gives the pretzels their distinctive flavor. Note: Historically pretzels were boiled in lye before baking. 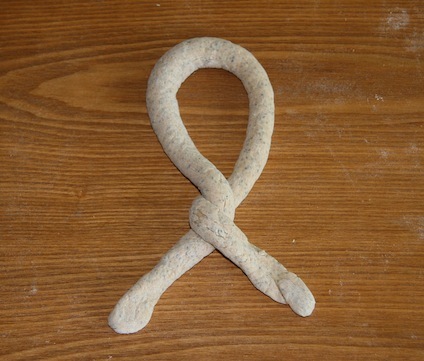 Some purists still believe this is the only way to prepare a true pretzel. However, as you are unlikely to have food grade lye just lying about (no pun intended), we’ll approximate it using baking soda. 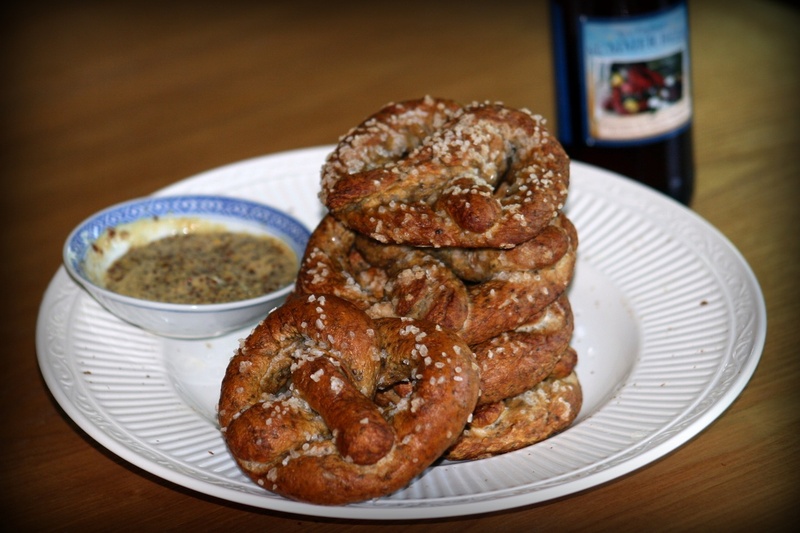 On a side note, you can prepare as many or as few of these pretzels as you feel you’ll eat. By freezing those you won’t eat right away, you can repeat just this last set of steps when you get a pretzel craving. They are best when served fresh from the oven. Fill a medium stock pot with water and place over medium-high heat. Stir in the molasses and 2½ tablespoons baking soda. While your pretzels chill, bring the water to a rolling boil. Lightly dust each pretzel with baking soda. Place the pretzels one at a time into the boiling water and cook for 15-30 seconds on each side. Carefully remove from the boiling water and set aside in a collander to drain. Place the pretzels on a baking sheet and lightly salt them. Bake for approximately 15 minutes, or until pretzels are golden brown. Enjoy plain, or with whole grain mustard, and your favorite beverage. 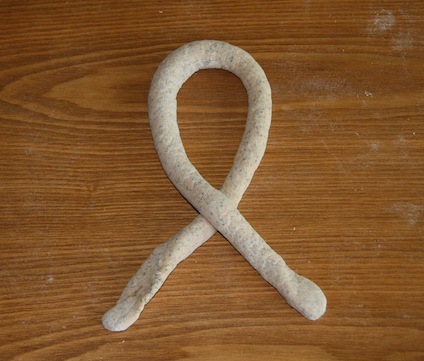 What do pretzels conjure up for you? Do you have a favorite recovery food? Share your warm, bready hug in the comments. Tim Woodbury is the runner and author behind the Midpack Runner blog. His new book, Running Recipes: Chia-Powered Sole Food, features 21 unique and delicious recipes featuring chia seed, and more are being added daily. Nice. The last time I tried to make pretzels they didn’t turn out very well, but this recipe looks like it might work out a little better. Thanks, Dan. I’d be lying if I told you it only took one try, but I think you’ll find these just right. Thanks, Katie! You’ll have to let me know how you enjoy them. Don’t these look awesome? Thanks Tim for sharing the recipe. I’m excited for the rest of your recipes in the new book! This one isn’t in the book (although, it may make a future revision). The next closest recipe in the book is probably the homemade bagels. Chia works well in these chewy yeast breads. These look yummy, but where can I buy chia seeds? Hi, Jane. I usually buy chia seeds on iHerb.com, but Amazon sells them as well. I’ve also been told that you can find them at Whole Foods (maybe look for the Bob’s Red Mill foods – I believe they have chia seeds, and Bob’s is a great brand).